Pioneer loves the Danforth East Arts Fair (DEAF) - and not just because we can shop for sparkly things or hand-crafted art pieces. 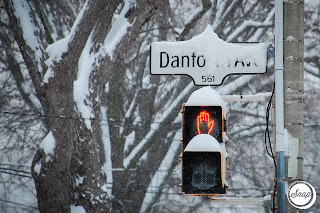 We had the pleasure of meeting yet another interesting person in our fabric of life on Danforth East: one of the photographers exhibiting at DEAF13 this coming weekend, who just happens to live a stone's throw from Pioneer HQ. A front porch interview was in order! Q. You've captured some amazing photography from around the world. How did you get started behind the lens? A. I grew up watching my father do a lot of travel photography and was always interested in it as a medium. I worked for World Vision, promoting youth advocacy and education, and travelled around East Africa for many years. There was a lot of great natural subject matter and I found myself taking photos for work more and more. I became sort of the unofficial official photographer on my team for awhile which was gratifying. As I explored photography further, I found my niche. I won a photography contest with a photo I took in Tanzania and that gave me a lot of confidence in my art. Q. What's your most recent photographic adventure? A. I had the chance to travel to Uganda with Photographers Without Borders. I was documenting Raising Voices, a program that helps prevent violence against women and children. It was really an amazing experience to be part of. Q. We love the bicycle pedal photo. What was the story behind that? A. This photo was taken in Rwanda and I just thought it was so touching to make the connection visually between a nation struggling and working hard to overcome some terrible history with this young man riding a bike emblazoned with the word Pheonix. It was a symbol of the future (and the importance of the bicycle to developing economies). Q. Can you talk about Joni Mitchell? A. I loved the irony of that street photo. I tried to track down the street artist that made that sign, but no luck. Last year when Luminato invited Joni Mitchell to be a special guest, I contacted them and asked if this photo could be given to her somehow. They agreed, so I sent a framed photo to them. I didn't hear from them for awhile, but they eventually confirmed that yes, she had been personally given the photo. So who knows! I'm hoping that she's framed it and has it on a wall somewhere, but I'll never know. Q. Why do you love living on Danforth East? What brought you here? A. I love neighbourhoods with a sense of possibility. As time goes by, there are more and more bright spots popping up along the Danforth and it's exciting to watch the street scenes coming to life. I love cultural diversity and it's so evident that we are a "mosaic" here, with the Ethiopian and Moroccan restaurants and other ethnicities. There's a real sense of community and community support. Q. What's your favourite spot around here? A. Well, you can usually find me at Red Rocket or Caketown Cafe working on my photo editing. Or S. Walter Stewart library. Lots of peace and quiet there! You can get your hands on your very own Henry Vanderspek at the Danforth East Arts Fair this weekend. He also takes orders via email and his website. The arts fair is happening Saturday and Sunday at East Lynn Park. Our advice is to get there early before the crowds scoop up all the treasures! More information can be found at www.deca-arts.ca - or feel free to drool over their Pinterest page!